I find that often the hardest places to get to, offer the most rewards. Bacharach certainly proved this to be true. 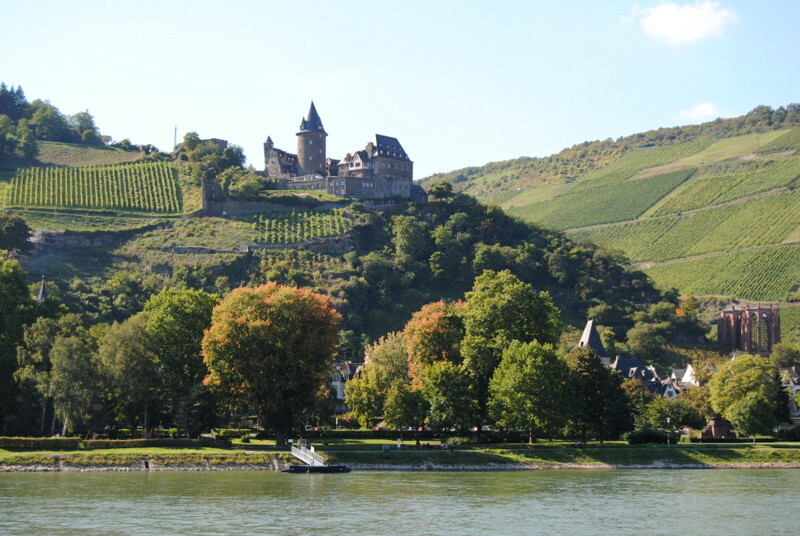 After catching a train from Amsterdam to Köln we hopped on a smaller regional train to take us to Bacharach. It took us about 6 hours to reach a place that looked so close on the map. 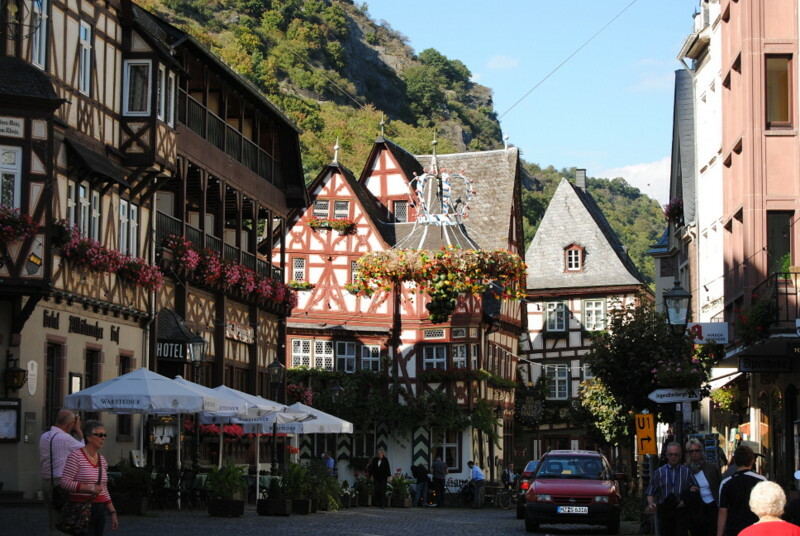 Bacharach is a beautiful old town nestled between the Rhine River and the hills. 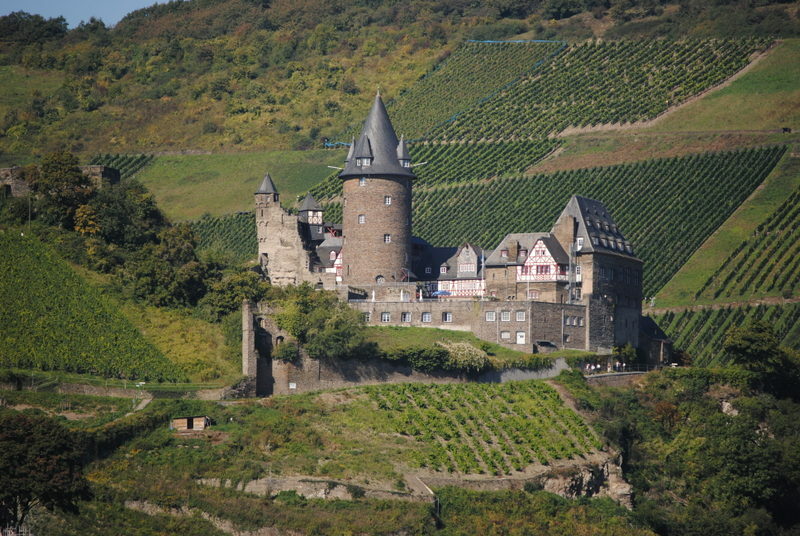 It is located in the Middle Rhine area which is a UNESCO World Heritage Site. 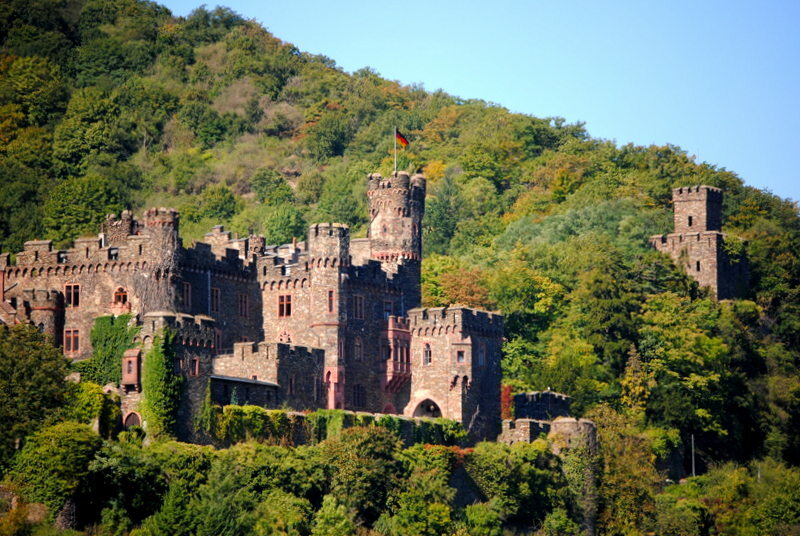 I had booked us into a room at the youth hostel which was located in a castle called Burg Stahleck. We paid 110 euro for two nights and this included a breakfast. The castle hosts groups of children and youth and offers them an opportunity to explore the area and a medieval castle. The excitement and enthusiasm of the children was a bonus. I thought about how excited I would have been, at that age, if I was able to spend a few days with a bunch of my friends at a castle. (I was pretty excited at the age I am now!) Our room was not fancy and the washroom was up the stairs and across the hall, but it had a great view and was quiet and peaceful. The hostel sold nice wine which was served in a clay vessel that you paid for and kept. I thought it was a nice souvenir. Getting to the castle was part of the fun. From the train we walked down the main street and turned up the hill at the side of St Peter Kirche. The path to the castle zig zags up the mountain and offers beautiful views of the surroundings. The path was probably as old as the castle and I imagined people walking up this path centuries before. 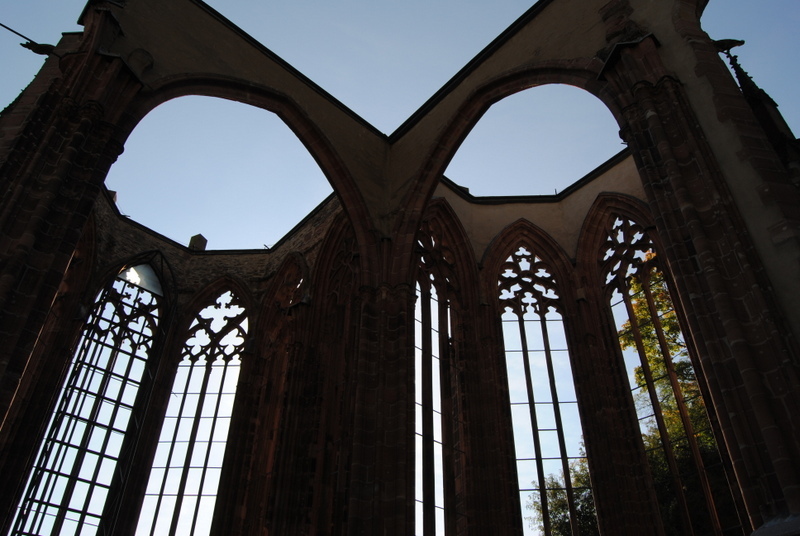 Right past the church, on the trail to the castle, are the haunting remains of Wernerkapelle, the Gothic remains left as a tribute to the awful excesses against the Jews. This area is known for its many castles. We took a short river cruise, for approximately 25 euro. 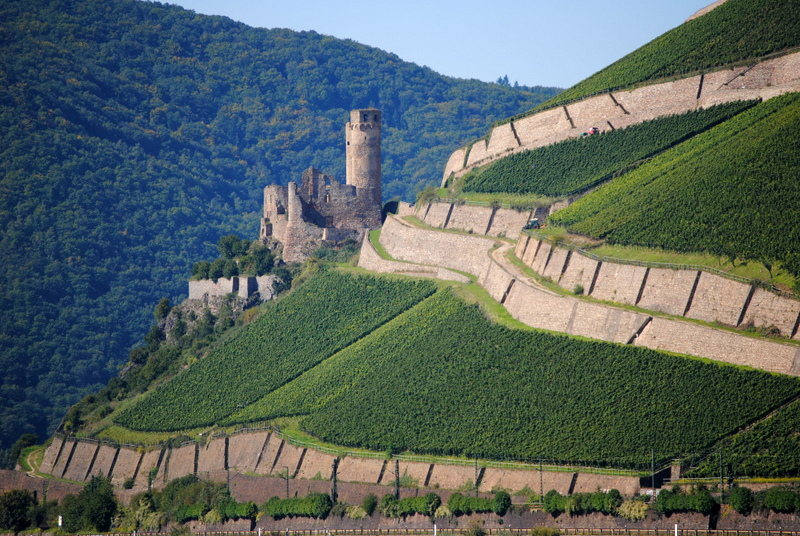 We saw a lot of castles on the hills on either side of the river, beautiful vineyards and lovely old German towns. The cruises can be as long or short as you like depending upon how much money you want to spend. You can hop off the boat and explore a town then catch another boatgoing back. Two days was not enough time to spend in this area and I was sad to be leaving it so soon. I would return to this area again and try to give myself enough time to check out some of the many hiking trails in the area. Brugge was the first stop in a 6 week tour of Europe. We arrived by train after a flight from Halifax to Heathrow airport. We took the underground from Heathrow to Kings Cross-St Pancras. 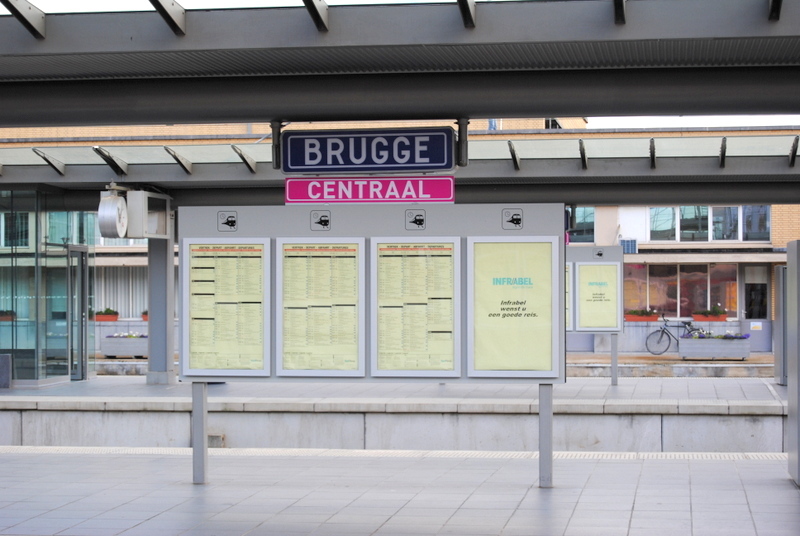 Then we travelled from St Pancras Station to France where we caught another train to Belguim and a small regional train to Brugge. I had allowed for several hours to reach St Pancras thinking that customs and the travel from the airport would take a lot of time. This extra time allowance was not necessary, but we weren’t able to change our tickets for earlier ones. 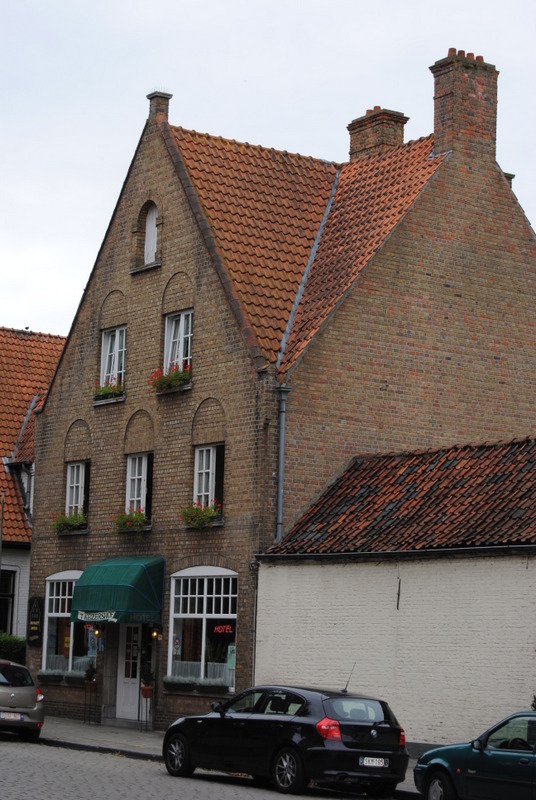 Our accommodations were already confirmed at Hotel t’Keizershof for 44 euro per night including breakfast. It was a short hop from the train station…if you departed by the correct door. We soon figured out our mistake and make our way to the hotel. Hotel t’Keizershof was very clean, in an older building. Our room faced the street. I was excited to hear people going past from the train station with their wheeled suitcases; it seemed to match the feeling of being on the road. It was to become a soundtrack for the next 6 weeks and remained consistent in every country. There was a sink in the room, but we had to go down the hall to use the bathroom or shower. A sign in the room told you not to wash clothes in the sink, which was a disappointment to me as I had hoped to do this every night. The breakfast was served in a bright room overlooking the street. Our fellow travellers were from all over the world. 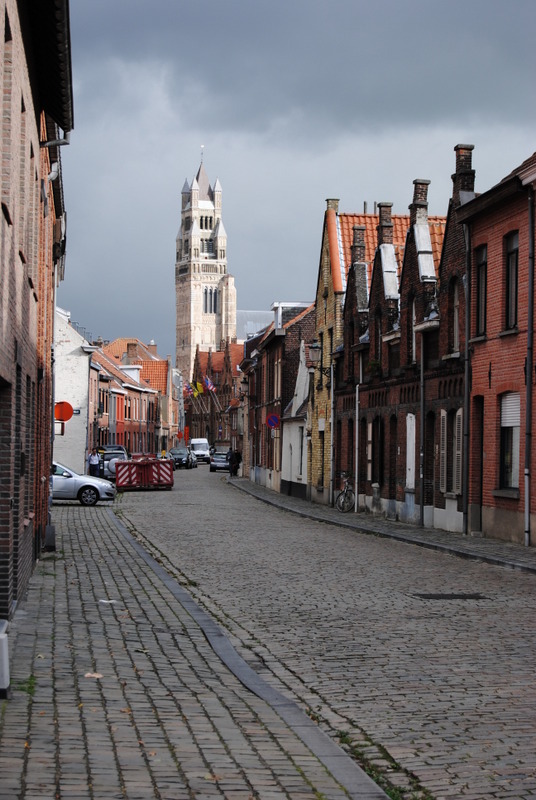 We were an easy walk to the historic centre of Brugge. 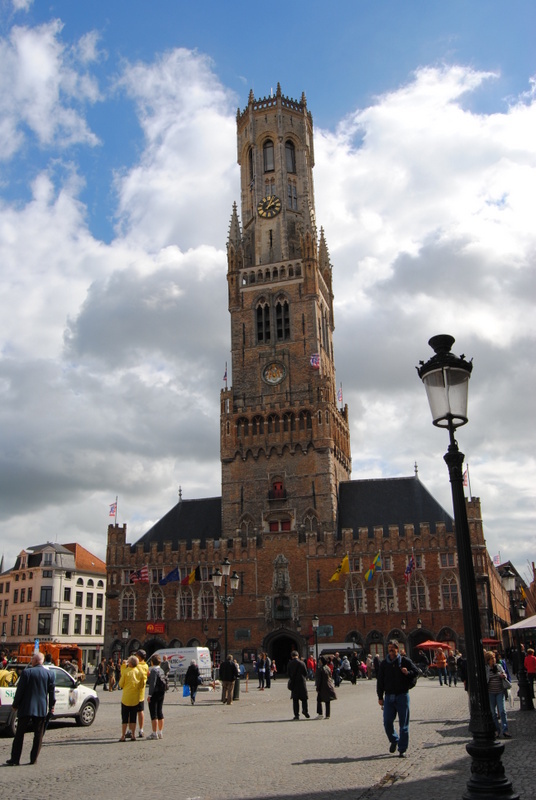 Brugge comes from the Old Norse, “Bryggja” which means landing stage. 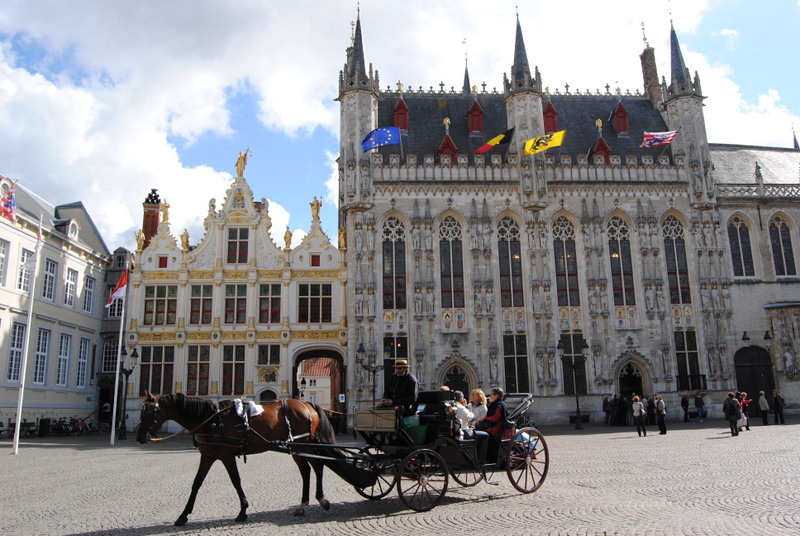 In medieval times Brugge became a centre of commerce. Its beautiful canals and prosperous merchants earned it the name Venice of the North. Named a UNESCO World Heritage Site in 2000, the city’s well preserved medieval buildings, canals, cobbled streets and market squares draw tourists from all over the world. 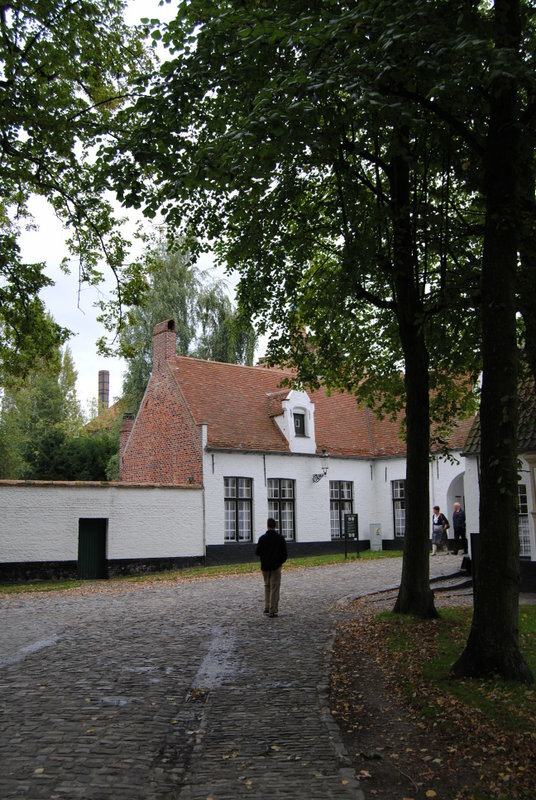 Quiet and peaceful Beguinage. This monastery housed nuns from the Beguine movement for many centuries. 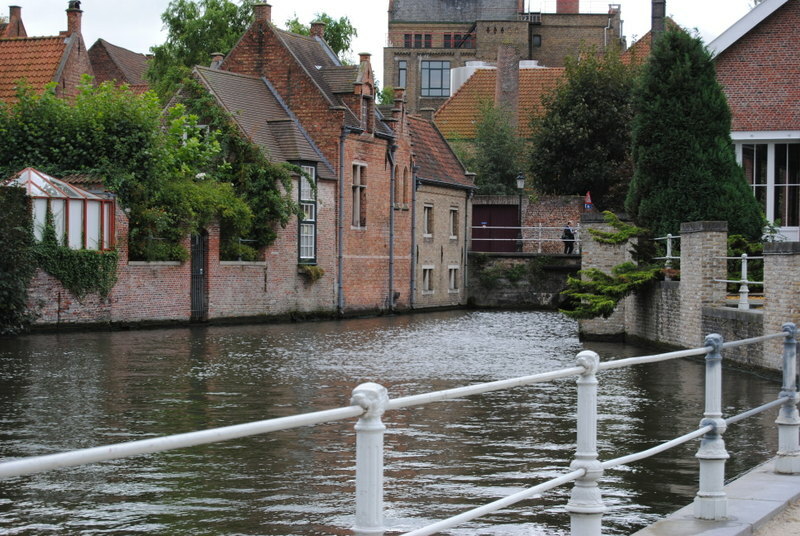 Along one of the canals in Brugge. I have never seen a violin quite like this one before. Cinque Terre is a UNESCO World Heritage site on the northwest coast of Italy. 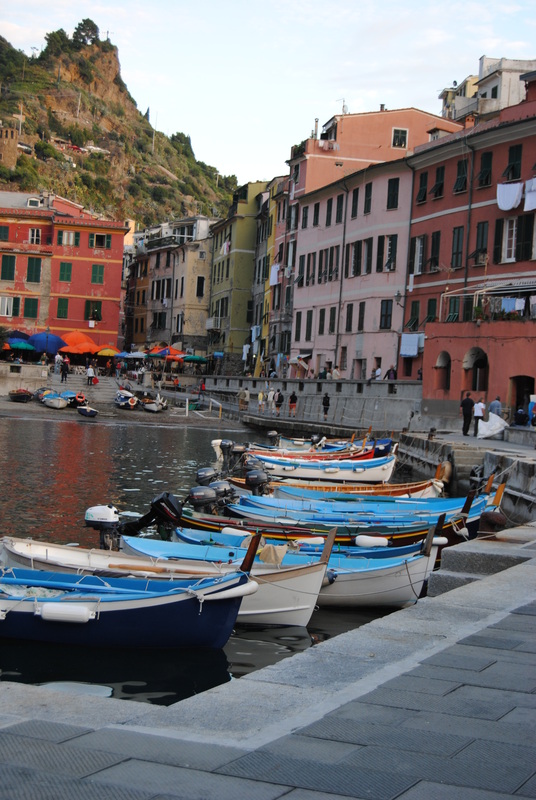 It is named for 5 towns Monterosso al Mare, Vernazza, Corniglia, Manarola and Riomaggiore. 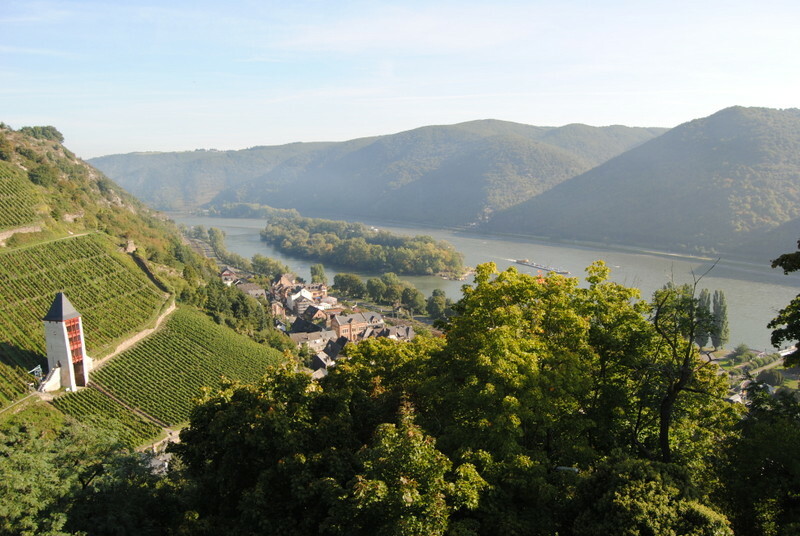 Cars are not allowed in the 5 towns, so visitors must arrive by rail, ferry (April to October) or by hiking trail. We arrived in Cinque Terre from Nice, France. There was a bit of switching of trains and much travel on the slower regional trains before we got to our destination. Sometimes the best places are the most difficult to get to. 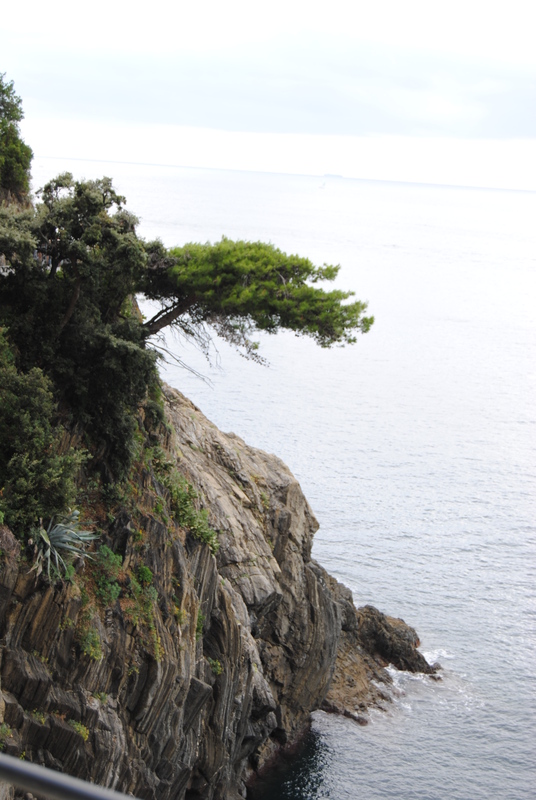 Cinque Terre is also a national park. When you go there you should purchase a park pass. Passes are available at different prices depending on how many days you plan to use them. 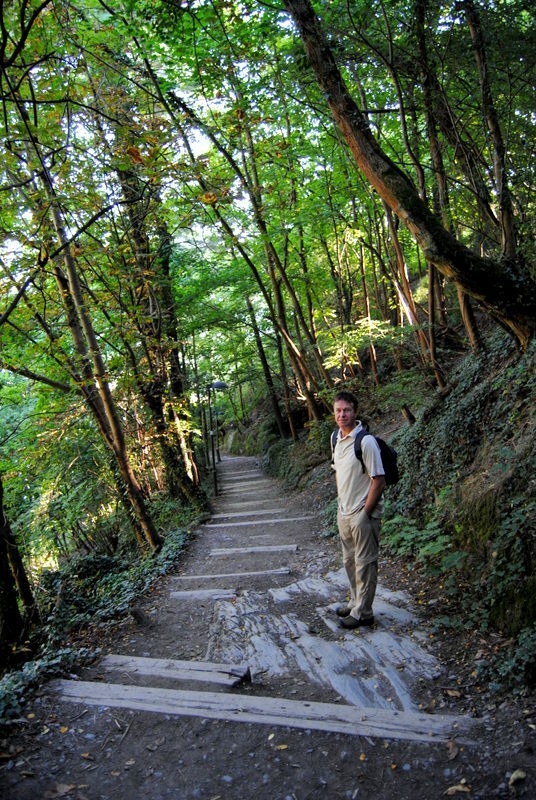 The pass gives you access to the hiking trails and allows you to travel on the trains between Levanto and La Spezia. This is great because if you are not a great hiker you can take the train to one village and hike to the next or even take the trains from village to village. Cornigila is the only village that is not directly accessible by train and you will have to wait for a bus, hike up a hill or walk the steps. The park pass comes with a map of the park including the hiking trails with the distances and times for walking the trails. We stayed in Vernazza. Our reservation at Vernazza Rooms was not honoured and we had to scramble to find other accommodation. We went to the cafe just down from the train station called The Blue Marlin, where they also serve a great breakfast. The bartender suggested we check around the waterfront square for someone renting rooms. The father of Martina Callo, who also rents rooms, was sitting on a bench in the square, and although his daughter didn’t have any vacancies, he found us a room right on the square for one night. We couldn’t believe our luck. We had a beautiful room overlooking the harbour and square. 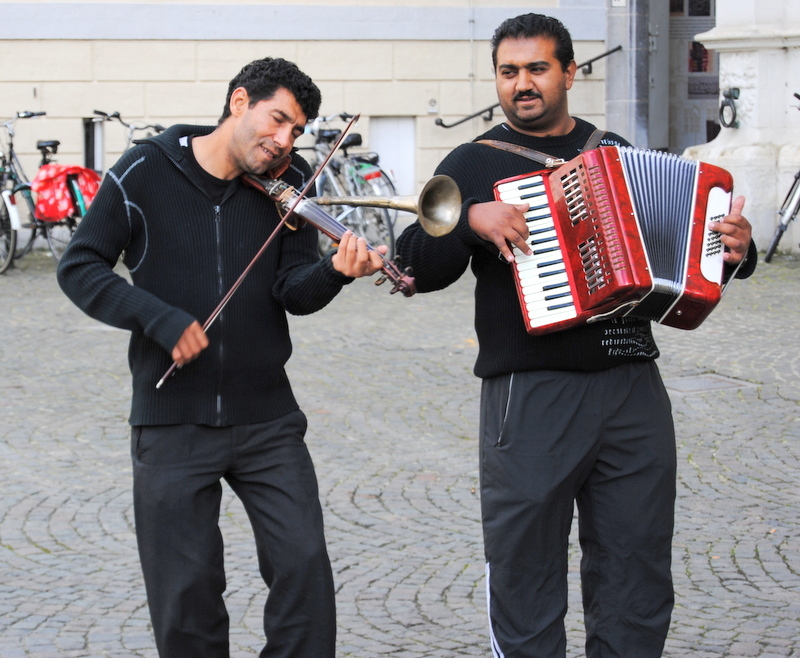 The next day he introduced us to a young woman who had a room available for the duration of our stay. It was a bit more expensive and not on the square, but was a lovely room and we were happy we could stay. 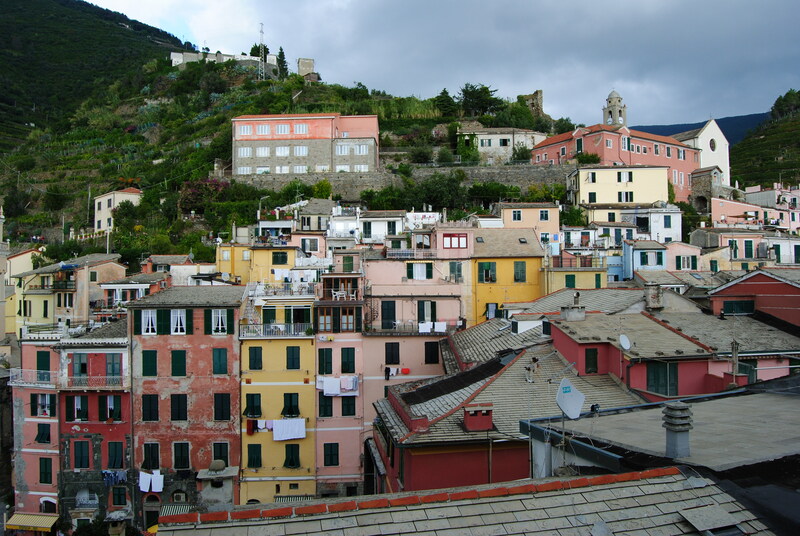 Vernazza has tall buildings built along a narrow piece of land near the water. 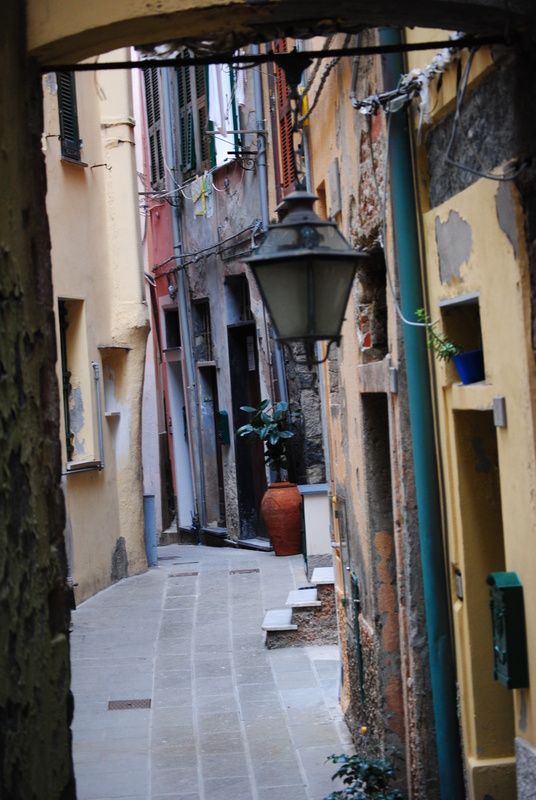 The towns narrow alleys are fun to explore and lose yourself in. It was early October and the water was still warm enough for swimming. I was quite excited to be able to swim in the Mediterranean in Vernazza’s sheltered harbour. We did a few of the hikes and took the train as well as the ferry and visited the 5 towns. 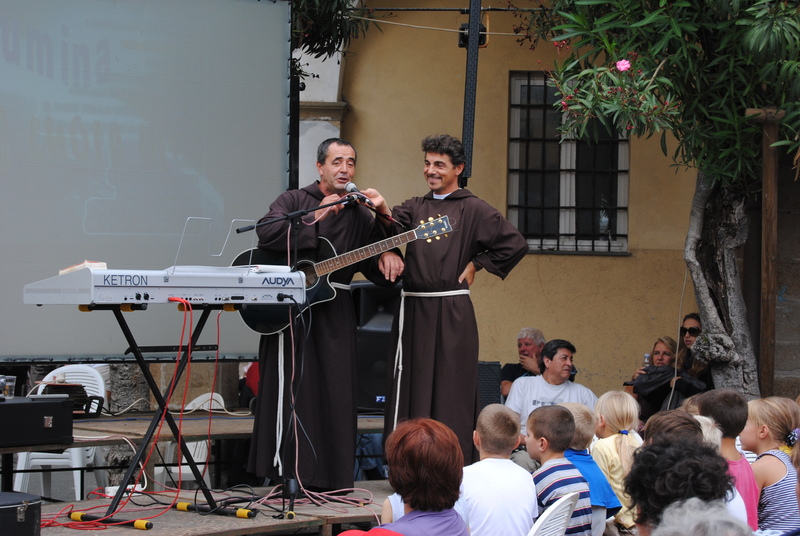 We were fortunate to arrive for a festival in Monterosso. It is always fun to join in the festivities in a different country, even if you don’t quite know the reason behind them. 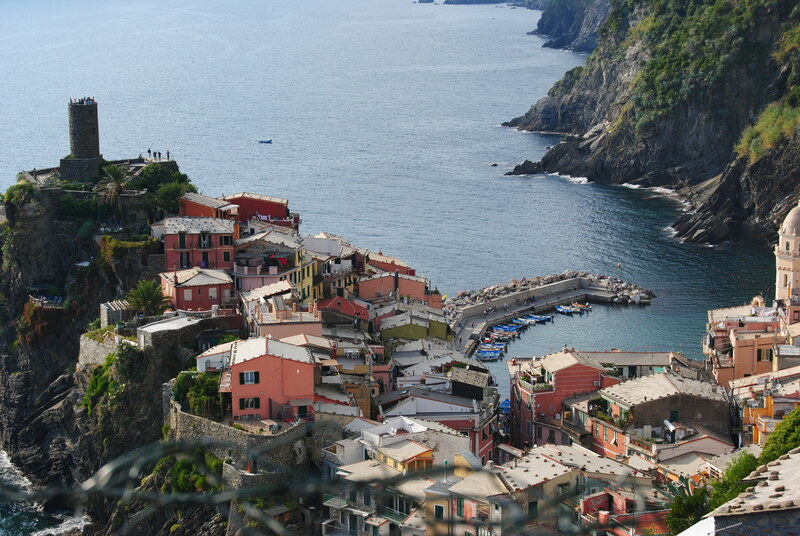 The Cinque Terre was an unforgettable place and well worth a visit. The only problem was that lots of people felt that way. During the day the towns could be fairly busy, but by evening most people had left for hotel rooms outside the park. There was always something to do and three days was not enough time to spend here. 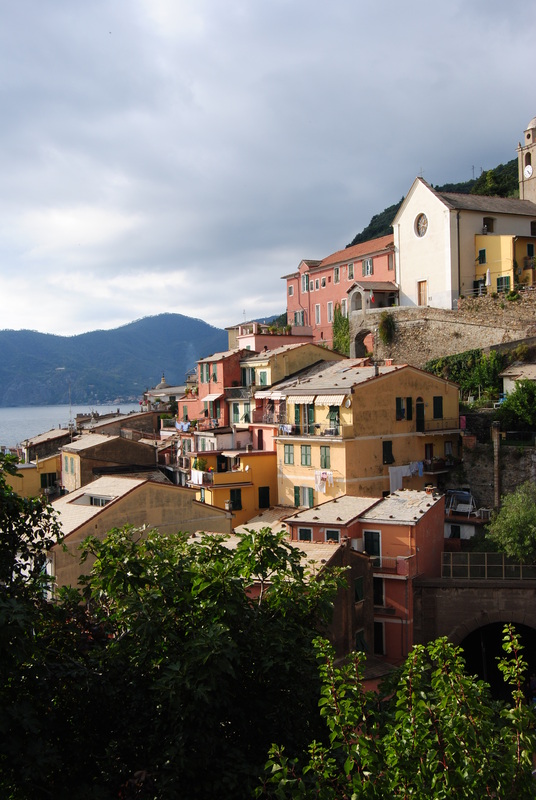 In October 2011, Vernazza was hit by a devastating flood. It was heartbreaking to see the damage that was caused to this beautiful town. 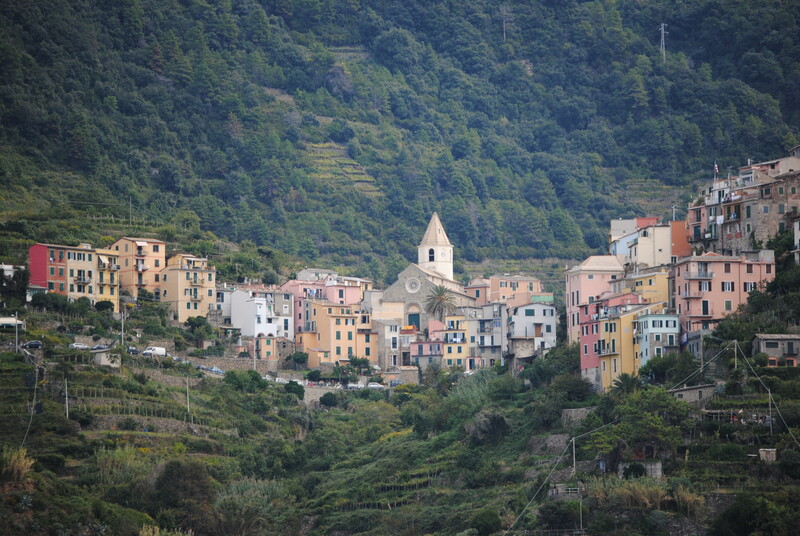 Efforts to help restore Vernazza are being supported by http://www.savevernazza.com.